This article was written By Christopher Brown on 18 Apr 2011, and is filed under Uncategorized. Christopher Brown is known round these parts as The Uncoolcat, a name not given to him but chosen by himself. You can read his ramblings at Cool Stuff for the Uncool. 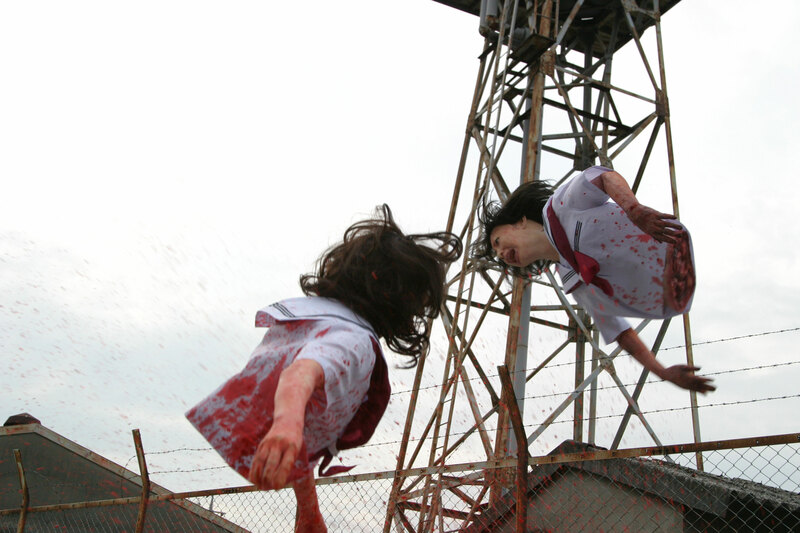 As if to prove that a horror movie isn’t worth jack squat without a sequel, hot on the heels of Teke Teke (2009) comes Koji Shiraishi’s sequel, Teke Teke 2. Shot pretty much back to back with the original, Shiraishi uses a lot of the same conventions he did in the first one, while changing things up just enough for the sequel not to be a carbon copy of the original. The film starts out by recapping the events of part one while wrapping up any surviving main characters’ stories. Needless to say, wrapping up a character’s story in a horror film seldom includes them winning the lottery, buying the cutest puppy in the world, or acing the final exams so that a freeze frame can be used as the character jumps into the air in triumph. In the sequel, two friends, nerdy and ostracized Reiko and pretty and popular Natsuki, are heading to school when they come across a crime scene with Teke Teke’s handiwork. Also on the site is the awkward and shy professor’s assistant from the first one, who’s taken on continuing the research on Teke Teke after the characters from the first film’s stories ended in madness and death. The schoolgirls continue to school where we see that the class bully and her gang of schoolgirls have decided to pick on “oh so serious” Reiko. Worse than that, they are stealing her one and only friend Natsuki away with the chance to be one of the cool kids at school. It seems in both films, Shiraishi is interested in both betrayal and guilt. In the original, Kana comes between her best friend and her potential boyfriend. In this one, Natsuki must choose whether to stick by her friend or succumb to the peer pressure of the more influential kids. Natsuki’s eventual decision leaves her feeling guilty and Reiko feeling betrayed. Bullying is a big deal in society today and it’s interesting that Shiraishi chooses to show both the victim and the victimizer in a sympathetic light. But wait a second! Isn’t this a monster movie? 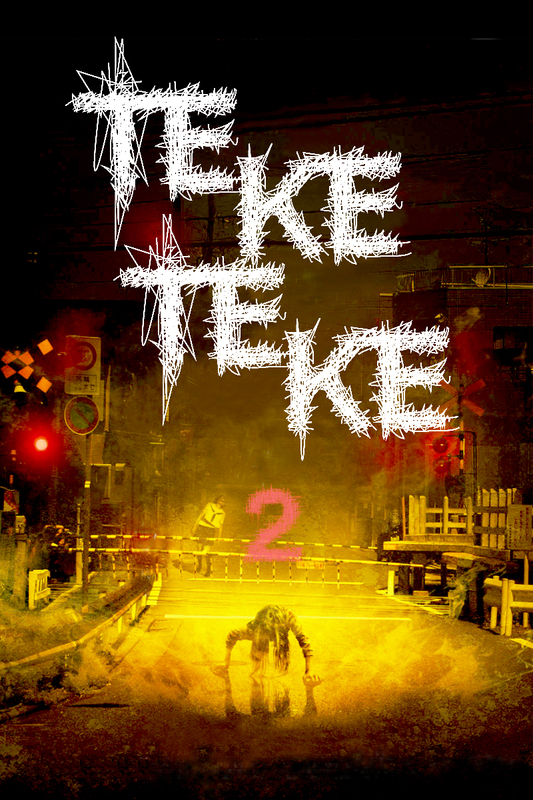 Teke Teke 2 suffers the same problem of the first one in that it takes quite a while for the horror story to start proper. We are introduced to a number of characters, which means much more victims this time round, but also means more time spent on setting them up. Also, we have the continued story of the professor’s assistant investigating any loose ends from the first one, finding out more backstory on Teke Teke and adding even more rules to the Teke Teke mythology (now there’s a chant to go along with the various other stipulations to either save yourself from Teke Teke or enrage her). Teke Teke finally makes her way into the film, and this time it’s not only her looks that are similar to Belial in Basket Case (1982). Reiko is also using her as an instrument to enact revenge on those who have tormented her. Another interesting element brought up is Natsuki’s cowardice, whether it be her choosing to side with the bullies rather than sticking by her friend, or her fear of stopping her old friend’s killing spree. It adds a lot to her character and definitely adds more significance to the film’s closing moments. As mentioned earlier, the one good thing about more characters is more death and gore, and this sequel culminates as the remaining bullies seek out Reiko in an abandoned building while the professor’s assistant and Natsuki race to end the Teke Teke curse. The final act of this film recalls the beginning hook of the first film in both atmosphere and pacing. And shockingly, someone is killed in a way that doesn’t involve bisection! Blood and body parts fly as Reiko and Natsuki finally confront one another in a fun and somewhat emotional ending. There is a lot to like about the movie. The social commentary, the gore and the monster. But as with the first, the pacing sometimes leaves a lot to be desired. When the assistant and Natsuki find another clue involving surnames to do with Teke Teke’s curse, it holds all the thrills and suspense of watching someone solve a math equation. And though it’s nice to let the characters have time to develop, sometimes it does feel like Shiraishi is stretching the plot to fill time. Still, like the first one, if you are a fan of monster movies this is a great rainy day watch. Maybe Shiraishi can make a Teke Teke 3, in which Teke Teke and Belial meet, fall in love and slaughter New Yorkers on their honeymoon. And maybe they can call it Monsters Teke Teke Manhattan! I’m so sorry.